Today, it’s quite possible for patients to get the “extreme makeover” smile formerly reserved for the rich and famous. 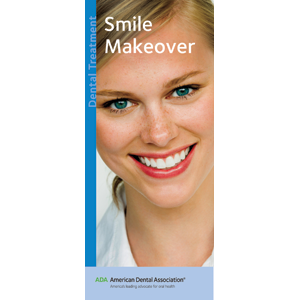 This brochure discusses the effects of age on teeth and gums and examines the various procedures used to correct teeth that are discolored, unevenly spaced or misaligned, missing or worn down. Explains to patients the various smile enhancing dental procedures, including orthodontia, veneers, reshaping, whitening, tooth-colored fillings and bonding. 8 panels. Minimum order 150. Click Add to Cart then personalize for free. Now you can add personalized information on the front, back, or both covers on all brochures.